Schools of bunker in the Peconic River May 14. 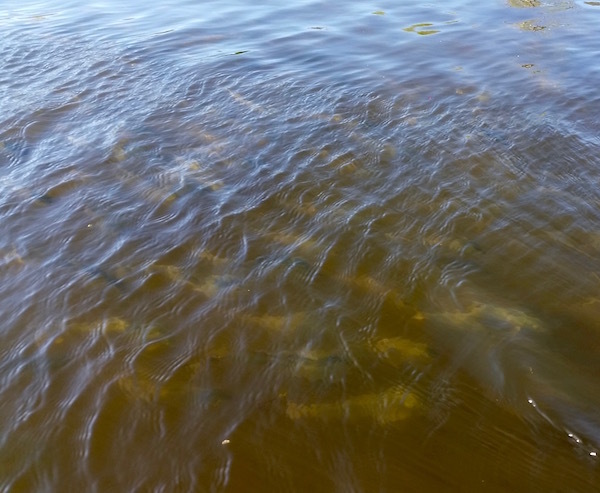 The Department of Environmental Conservation and Riverhead Town are partnering to harvest some of the over-abundant menhaden in the Peconic River, in an attempt to decrease the likelihood of a massive fish kill like the one that occurred at this time last year. The Atlantic States Marine Fisheries Commission recently approved the DEC’s request to allow commercial fishermen to catch more menhaden, also known as bunker, to reduce the number of fish that might otherwise die. East End commercial fishermen have been working with the DEC and Riverhead Town, and plan to remove as many fish as possible from the river in the coming weeks. According to the DEC, the goal is to improve chance of survival of the remaining fish, to use the fish caught as bait instead of having to dispose of carcasses on the shoreline and to eliminate or reduce the magnitude of a fish kill. The Peconic River has had a history of fish kills over the years, including in 1999, 2000, 2007 and 2009. During the spring and early summer of 2015, the DEC estimated roughly 300,000 adult Atlantic menhaden died and washed up along the shores of the Peconic River in Riverhead. 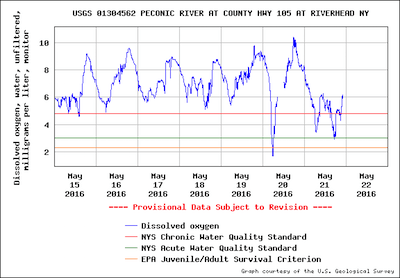 Dissolved oxygen levels at the Route 105 Bridge during the 2015 fish kills. Predatory bluefish can herd large quantities of menhaden into small water bodies such as the Peconic River, where the concentration of fish results in oxygen depletion and eventual asphyxiation. The area also has poor water quality with increased nitrogen levels which can exacerbate the magnitude of the fish kills. 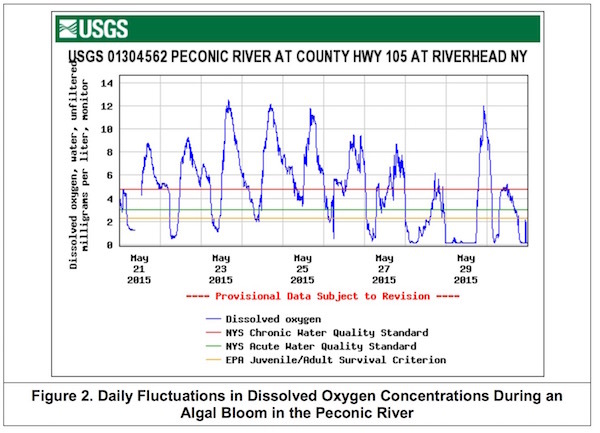 The U.S. Geological Survey, which keeps a continuous water quality sampling station at the Route 105 bridge, showed the most recent dissolved oxygen concentrations at 5.9 mg/L at 11 p.m. May 21, after a dip to near hypoxic conditions on May 20. The New York State Acute Water Quality Standard for dissolved oxygen is 3 mg/L, while the EPA says the fish need concentrations of just over 2 mg/L to survive. During last year’s fish kills, the most intense of which was on May 27, 2015, dissolved oxygen concentrations were near zero. Dissolved oxygen levels at the Route 105 Bridge this week. The New York State Police and DEC staff recently flew over the area and saw huge numbers of menhaden throughout the Peconic Bay system. The Atlantic States Marine Fisheries Commission has allowed New York to harvest an additional one million pounds of menhaden here as part of their episodic event program. To date, commercial fisherman have harvested over 300,000 pounds of menhaden from the river, but there are still far more fish remaining than expected.